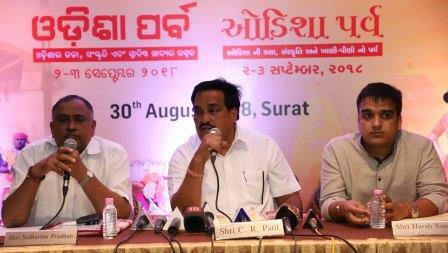 Surat: Odia Samaj, New Delhi is going to organize a colourful celebration called “Odisha Parba” at Surat, which is one of the most prominent business towns in the state of Gujarat, from 2nd to 3rd September 2018. This two-day-long event will be held at Surat International Exhibition and Convention Centre (SIECC), Sarsana, Surat. Residents of Surat and nearby towns of Gujarat will have a great opportunity to witness the unique culture, heritage, tradition, dance, melody and culinary delights of Odisha under one spectrum. Chief Minister of Gujarat Vijay Rupani is scheduled to inaugurate the two-day long Odisha Parba along with Union Minister of Petroleum and Natural Gas Dharmendra Pradhan, said C R Patil, Chairman, Reception Committee, Odisha Parba Surat. Narrating the objective behind this event, Sidhartha Pradhan, President, Odia Samaj said, “After the success of “Odisha Parba” at Delhi for two consecutive years in 2017 & 2018, now it’s time to bring the rich culture, heritage, history and legacy of Odisha to the people of Gujarat, a state which also boasts of a rich cultural legacy like Odisha”. The focus of the festival revolves around recreating the legacy of Lord Jagannath in Gujarat. A replica of the ‘Raths’ (chariots) used in the world famous Puri Rath Yatra will be displayed at the entrance gate. These will reflect the intricate applique work and Pattachitra designs of Odisha, adding a rainbow of colours to the whole ambience. The residents of Surat can enjoy authentic Odia cuisine in the form of popular street foods, exotic sweets, pickles and traditional Odia thali from nooks and corners of Odisha. The event will be a shoppers’ paradise offering world famous Odissi sarees, attractive handloom dress materials, bed sheets, kurtas, lungis, jute products etc. besides offering intricately designed handcrafted silver and Dhokra jewellery, Odisha’s famous appliqué work, woodcraft products and beautiful paintings using sea shells from the beaches of Puri. The works of award-winning artisans and weavers of Odisha are sure to be a grand hit amongst the residents of Surat. Cultural extravaganza from 3.00 pm onwards will keep the Surat residents entertained to the rhythmic beats of Odisha’s folk and classical music & dance. As a tribute to the two culturally rich states, a specially choreographed fusion item shall be presented showcasing Gujarat’s famous Garba and Odisha’s Odissi dance forms. Live Music Shows by popular Bollywood & Ollywood singers like Krishna Beuraa, Abhijit Majumdar, Babu Panigrahi etc, will heighten the entertainment quotient of the colourful evenings. Surat will witness some extraordinary performances which will uphold the traditional significance of Odisha– Animal Mask Dance, Jodi Shankha and Ranappa, Putula dance etc besides exotic tribal dances.